« Is Mo Farrah the “greatest British athlete ever”? I have referred a few times to line spectra. In my blog about the Messier catalogue, I mentioned that M42 and M1 were both examples of objects which exhibited an emission line spectrum. And in my blog on the three kinds of spectra, of course emission line spectra are one of the three types. So, how do emission line spectra come about? In a future blog I will explain in more detail why electrons orbit the nucleus of atoms in only certain allowed energy levels. This was first proposed by Niels Bohr in 1913, and the details were then worked out until a full explanation was developed by Erwin Schrödinger, Werner Heisenberg and Paul Dirac in 1926-1928 in what we now call Quantum Mechanics. As I mentioned in my blog on the different types of spectra, it was noticed by Kirchhoff and Bunsen in the 1850s that different salts produced different types of line spectra when they were burnt in a flame. This is because each element has an unique spectral signature. We will look at the simplest spectrum, that of the hydrogen atom. It is the easiest to understand, because the hydrogen atom only has one electron. Additional electrons complicate matters, because the electrons interact with each other in their orbits, but for hydrogen things are nice and simple. Because hydrogen is the simplest element, it is the most abundant in the Universe. About 75% of the “normal” matter in the Universe is in the form of hydrogen. In the visible part of the spectrum, the hydrogen emission line spectrum looks like this. Notice that there are a series of lines over towards the blue (left) end of the spectrum, and a prominent line in the red, which has an arrow pointing towards it. This line is so common and important in astronomy that it even has a special name, it is called the h-alpha (hydrogen alpha) line. How do these lines come about? The explanation for these different lines is that the different lines are produced by electrons jumping down between different energy levels in the hydrogen atom. The electron wants to be in the ground state, the n=1 level, in hydrogen. But it can be excited into higher levels, either by absorbing a photon (a particle of light), or by another electron hitting it. Once it finds itself in a higher energy level (n=2 or higher), it wants to jump back down to the n=1 level as quickly as it can. It is in jumping back down that the photons which we see in an emission line spectrum are produced. The figure below shows the simplified energy level diagram for hydrogen, with the n=1, n=2, n=3 etc. energy levels. 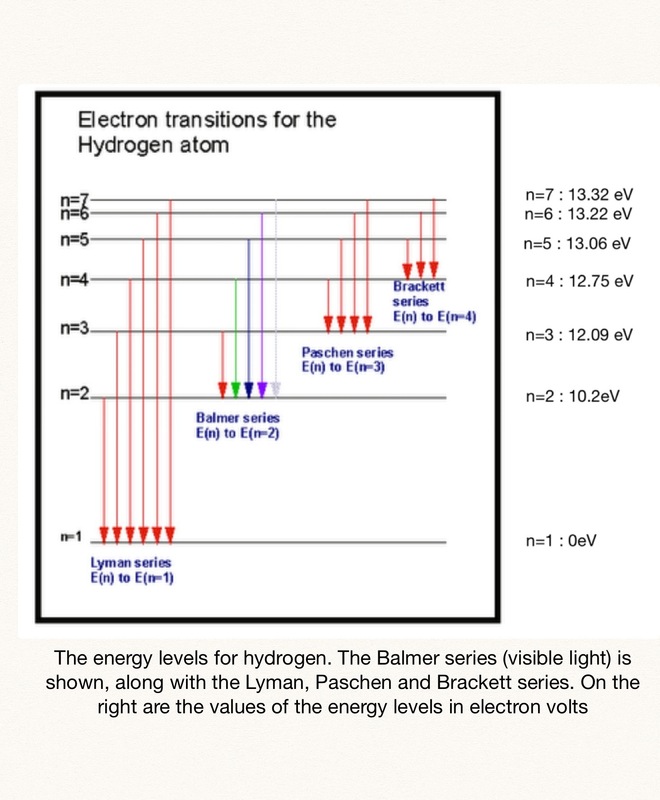 The Balmer series, which are all in the visible part of the spectrum, are produced when electrons jump from a higher energy level into the n=2 level. So e.g. from n=3 to n=2, or n=4 to n=2, or n=5 to n=2. It is the Balmer spectral lines which are shown in the figure above of a hydrogen emission spectrum. The figure also shows three other “series”, the Lyman series which are in the ultraviolet part of the spectrum, and the Paschen and Brackett series, which are in the infrared part of the spectrum. The Lyman series all end in the n=1 level (ground state), the Paschen series all end in the n=3 level, and the Brackett series all end in the n=4 level. This formula gives the energy in eVs, and these values are over on the right of the diagram for each energy level [Note: Chemists will often label the n=1 level as -13.6eV, and work upwards from this, physicists tend to label it as 0eV. It doesn’t matter, because all that is important is the energy difference between different levels]. eV stands for “electron volt”, and is just a more convenient unit for measuring the small energies involved than using the more usual Joules. It’s just like using nanometres to measure things on the atomic scale because metres are too big. An electron volt is defined as , so is pretty small as you can see. where is the energy difference between the two levels the electron jumps between. To go through a couple of examples, if an electron jumps from the n=3 to the n=2 level, the energy difference is . We need to convert this to Joules, so . To get the wavelength from this we write . This is in the red part of the visible spectrum, and is the hydrogen-alpha line we were referring to earlier. To work through a second example, if we look at the transition between n=5 and n=3 (part of the Paschen series) we get . So the photon will have a wavelength of , which is in the infra-red part of the spectrum. What is true for hydrogen is also true for the other elements, it is just that there is no simple formula for working out the energies of the different energy levels like there is for the energy levels in hydrogen. But, as we shall see in another future blog, even the n=2 and n=3 levels in hydrogen are not all at exactly the same level, it depends on the angular momentum of the electron in a particular energy level. This is where the s,p,d,f lines that I mentioned in this blog comes into play. So what I have explained above is a first approximation, but perfectly fine for most uses. I have grown to dislike the term “in orbit”. I try now to use “associated with”. I too have searched for a better term, but haven’t found one I’m happy with yet.